Marine Corps Corporal Daniel Lathers joined the military out of Lansing, Michigan in 2005 because he felt it was his obligation as a citizen to help his country during a time of war. He served for more than eight years until being honorably discharged. Corporal Lathers sustained physical and psychological injuries during his near decade of service. His major injuries occurred from attacks on his platoon’s outpost near Ramadi in Iraq, including vehicle borne explosions, rocket-propelled grenades and small arms fire. He suffers from PTSD, TBI, Hearing loss, sleep apnea, insomnia, chronic kidney stones and knee pain. 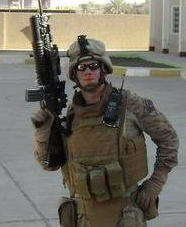 For his service to his country, Corporal Lathers has been awarded the Combat Action Ribbon, Navy and Marine Corps Achievement Medal, Navy Unit Commendation Ribbon, Iraqi Freedom Campaign Medal, Good Conduct Medal, National Defense Medal, Global War on Terrorism Medal, Global War On Terrorism Expeditionary Medal and Overseas Ribbon. Corporal Lathers, his wife Renee and their two children were gifted a mortgage-free home in Kyle, Texas in April of 2017.